I’ve been making a big effort to make my dinner at least mostly healthy and vegetable-based lately. I work until 9pm most nights and think eating a big dinner that late is really not a good idea. When I do my grocery shopping, I try to pick out produce that isn’t in my normal go-to, quick and easy dinner repertoire and I sometimes stumble onto a good combo of ingredients by chance. Tonight I combined the squash, mushrooms and scallions I just bought with a bunch of stuff I already had in my fridge and it was a noteworthy success. I imagine this loose recipe concept is very flexible, and would go with plenty of other flavors as well. 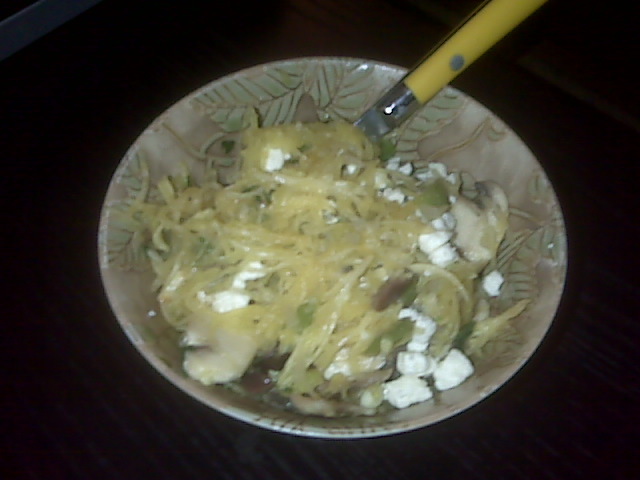 Spaghetti squash: cut in half, cut side down in a pan with a cup of water. In oven at 350 for 30-40 minutes. Cool a bit and then shred with a fork. Saute the following ingredients in a little olive oil, a couple of ingredients at a time until the mushrooms are cooked and the water has evaporated from the pan. Add the following and saute for another minute. Add the sauteed stuff to the squash and mix it all up. >Super Yummy! You won me at Garlic.